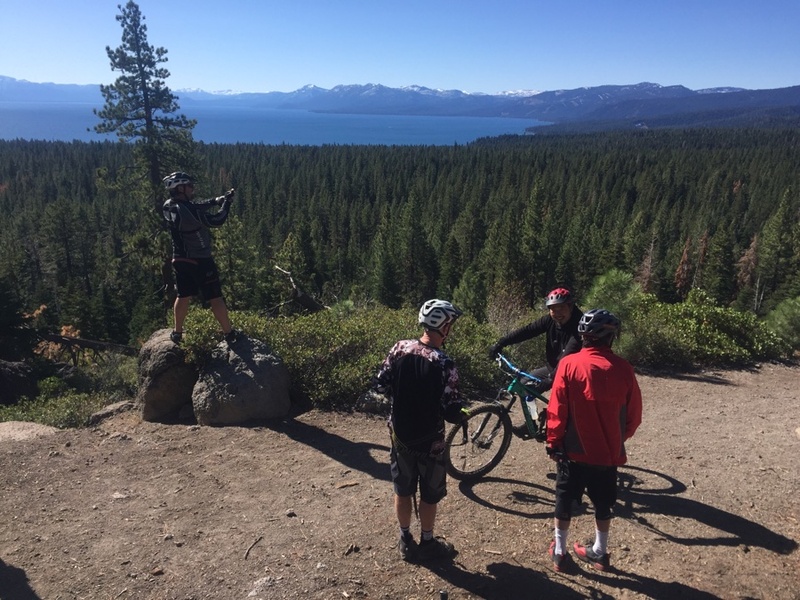 This year the boys Tahoe mountain biking trip slid well into September and we experienced the first whip of the winter storms to come. 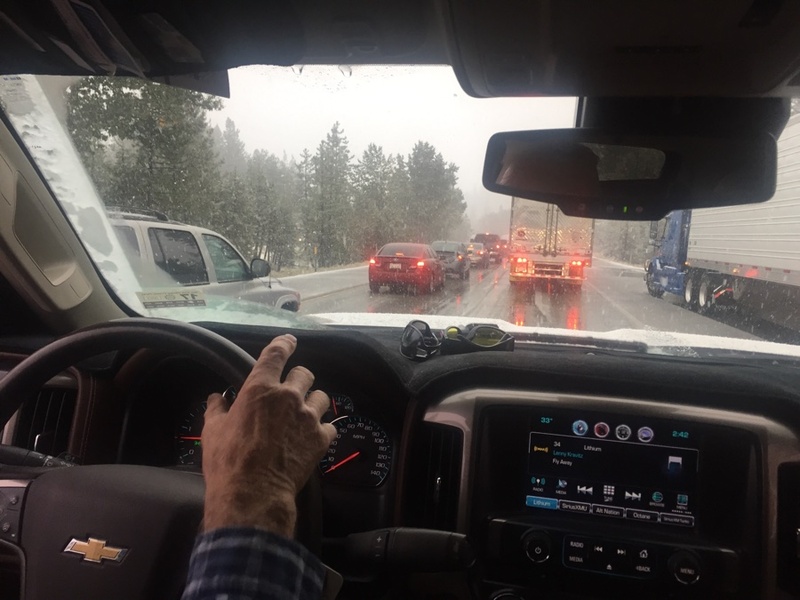 Jud was flying into Reno from New York on the Thursday and I joined Gordon, Gary and first timer Martin in Arroyo Grande to truckpool up in Gordon’s new Silverado. 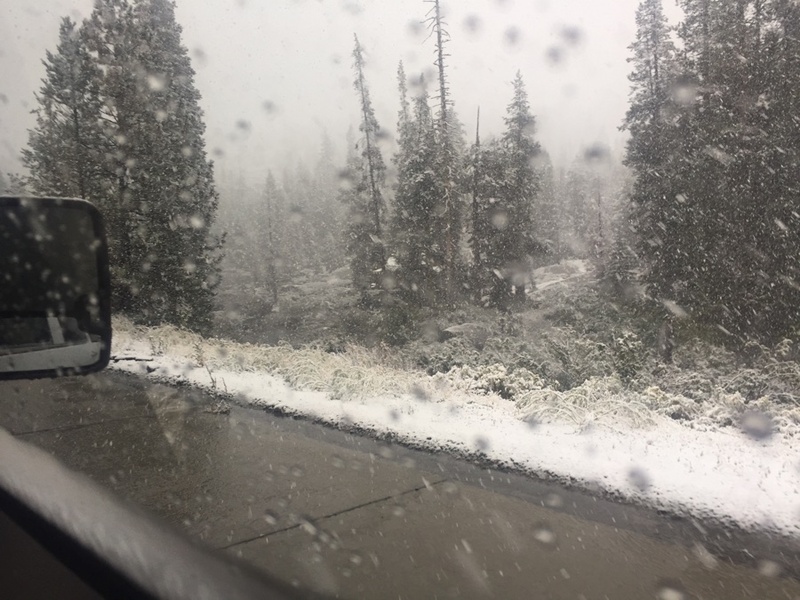 All was well til we started up the grade on Hwy 80 to Truckee, and then 20 miles out traffic ground to a crawl. Snow from above and traffic at a crawl. Out of my side window. I got that feeling that I’d packed slipslops when it should have been boots. 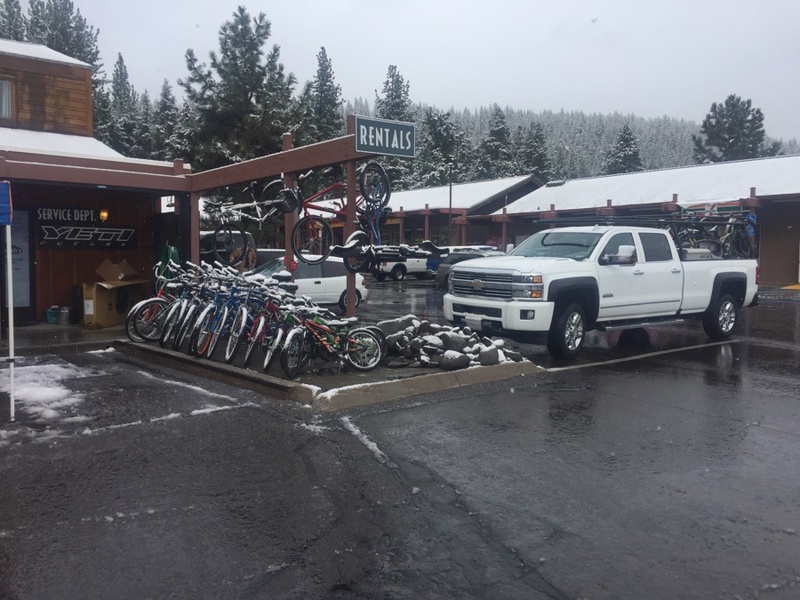 Were we meant to have skis rather than bikes in the back? 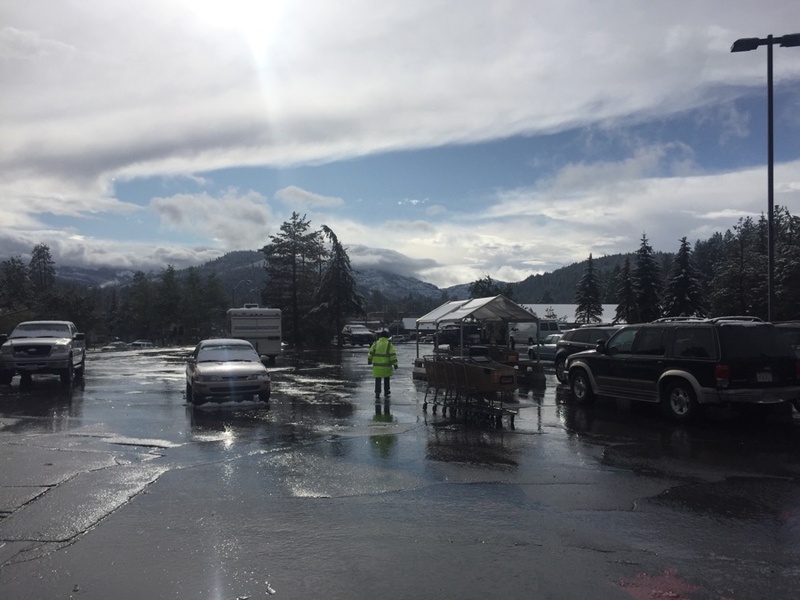 Backcountry bike shop in Truckee still had their bikes out so it must be OK.
View west from the Safeway parking lot, looks like the worst is over. 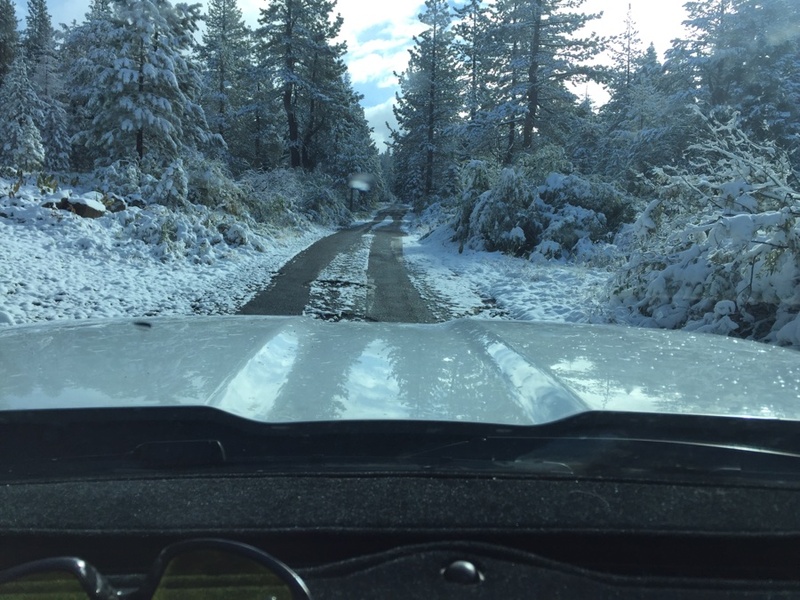 Took a drive up to Martis from Brockway summit – Ain’t going to be biking this anytime soon. 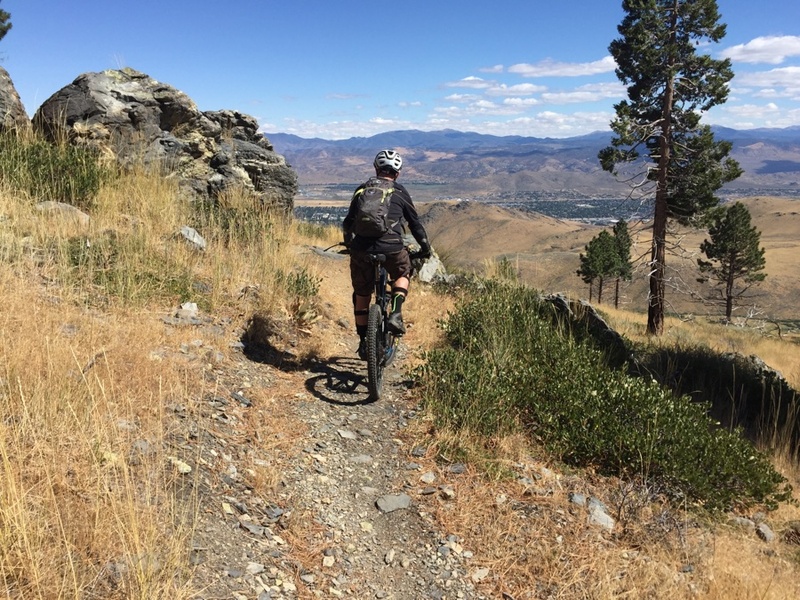 We looked for lower elevations choices and came up with two: First was Rancho San Rafael Regional Park just NW of UNR (University of Neveda at Reno) and then something around Carson City to the south along Hwy 395. 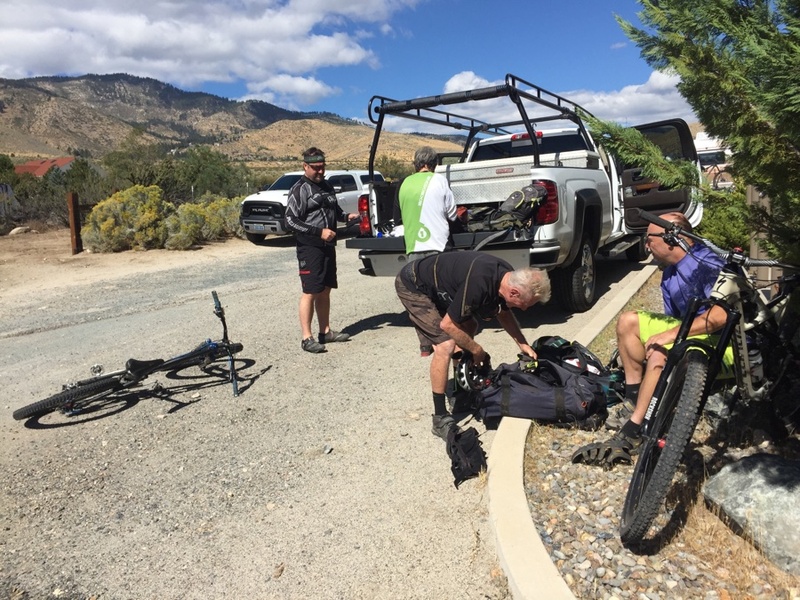 Did not take any photo’s of the UNR ride but it was an enjoyable workout on the rather barren hills with plenty of crisscrossing trails to get waylaid on. 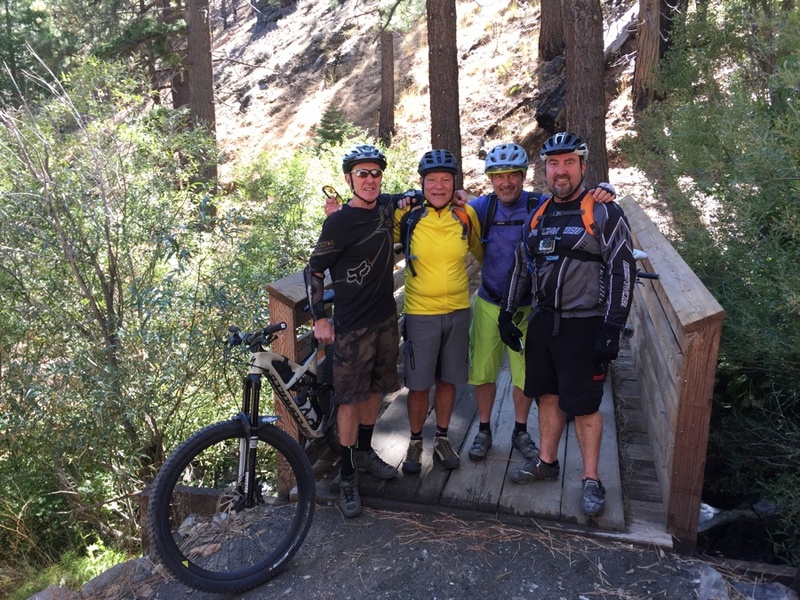 Next day, Saturday, it was still to snowy and cold around the lake so we headed down to Carson and the Kings Canyon to Ash Canyon ride, book said 15 miles with 2,200 feet of climbing. Turned out to be an excellent choice with the 7 miles of climbing starting on pavement, then dirt and finally the last bit on singletrack. 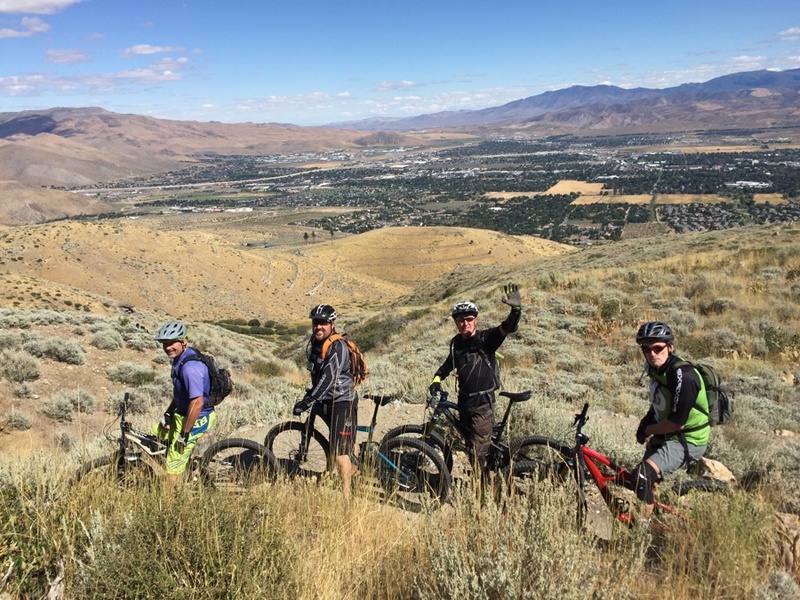 Downhill was 7 miles of fun on well groomed trail, forest, open hillsides and great views of the 395 valley below. Gary sets off on the final bit of climbing up the official trail singletrack. Gordon cruising somewhere along the rides highs. L to R: Gary, Martin, Gordon & Jud with the city of Carson as a backdrop. A bridge stop along the trail. Sunday enough of the snow had melted and we found some south facing slopes around Mt Watson, plenty of neat trails here. A shuttle was in order so we drop off Jud’s car at the finish near Tahoe City and drive to the start at Tahoe Cross Country. I hear Jud say something like “I’m leaving the keys in the truck’s glove box”. Why would he say such a thing, he was the shuttle driver? I wondered but was too busy getting my stuff together to give it a second thought. 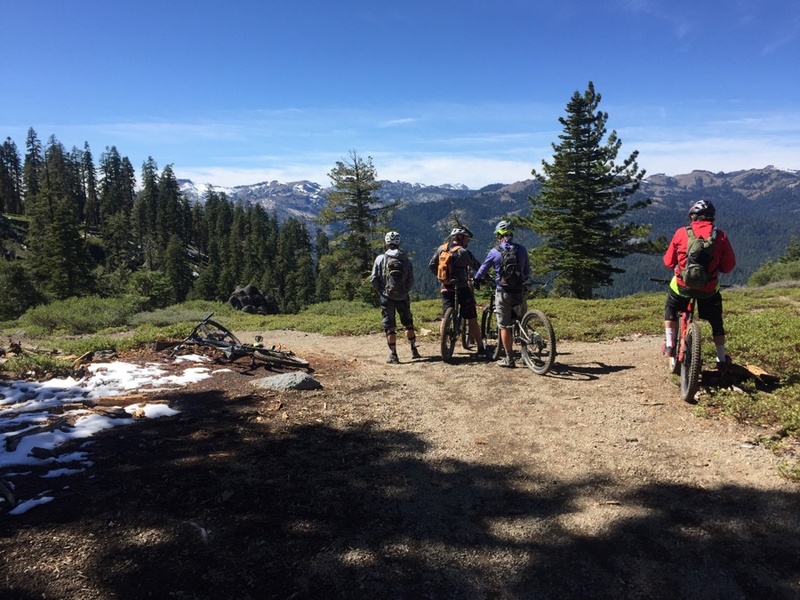 The ride starts out along the wintertime cross county ski trails and turns to single track as the grade increases. We make a side trip up Mt Watson itself before heading down but the dirt road was full of mud & slush and I for one was happy to get off the messy trail although I must admit that the view from the peak was exhilarating and rewarding. Somewhere along the next section I hear Jud exclaim: “I really did leave the car keys in the truck”. 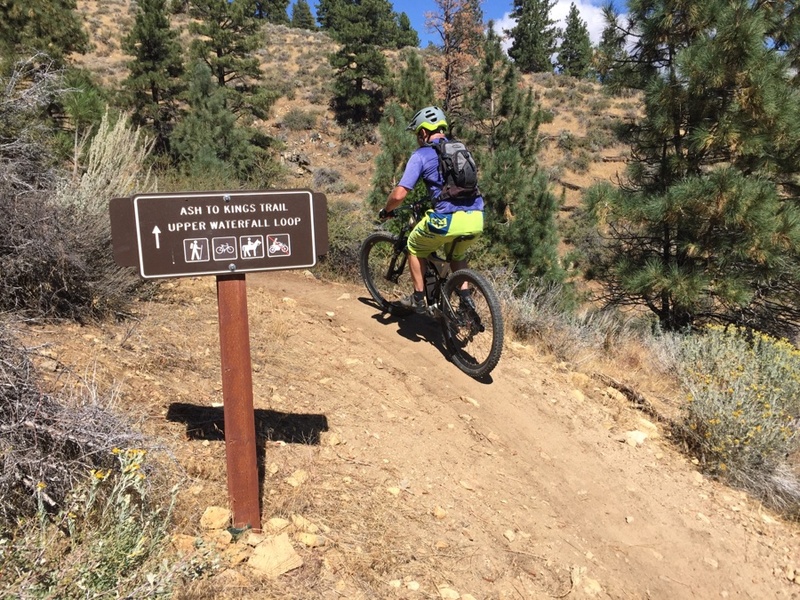 WTF’s all round but we finish the downhill section of the TRT (Tahoe Rim Trail) and head for Tahoe Brewing to decide the next step. Sierra views before the descent down and around to the left. 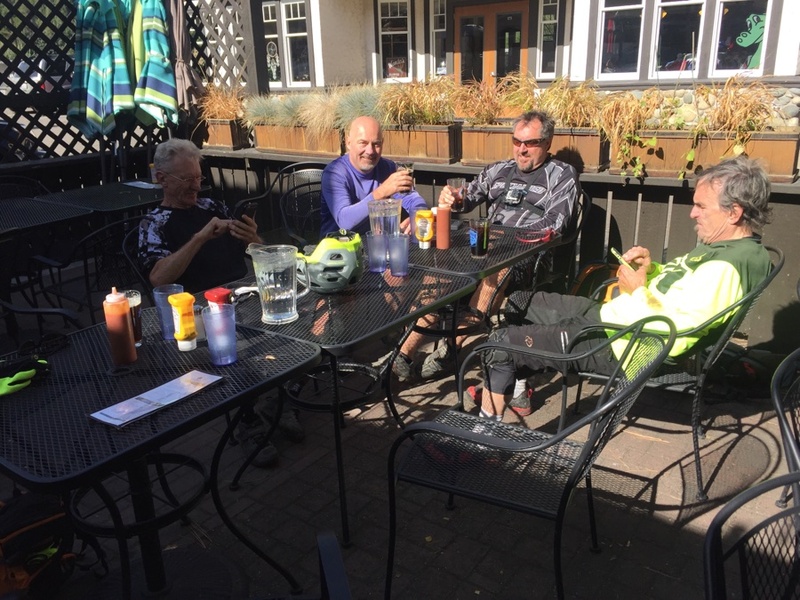 Tahoe Brewing Company for sustenance. Jud finds a lonely Uber driver to ferry him & Gordon back to the truck and everything ends happily. Lets see if the Strava link works.